The United States Capital Building (21030) is one of the larger Architecture sets, so I thought I would see how it would stack up as a parts pack for a modular building. I fell in love with the Brick Bank (10251) when LEGO released the high resolution images back in October. And it doesn’t disappoint in real life. Find out why here! Alex54 went through three revisions from his original idea for a corner building with a rounded corner tower, to the final building. If my experience is anything to go by, I suspect it was probably closer to thirty iterations! Irrespective, the end result is beautiful. Alex54 makes great use of the new fence pieces in Sand Green for the upper windows. I also like how he has done the dome on the corner turret, the shopfront windows and the patterned pavement. Head over to Eurobricks to see and read the journey from the original idea to this final version. 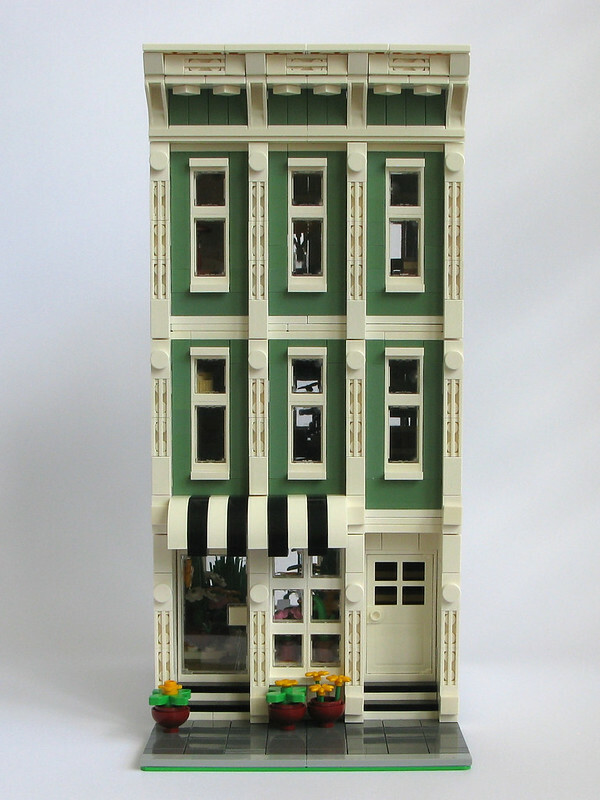 LEGO has released high resolution images of the next modular building, Brick Bank (10251). And it is absolutely gorgeous! There were so many “OMG!” moments for me as I was pouring over the images. I won’t reveal all of them, as that will spoil the fun for you, but I just have to point out the Sand Green windows, including those new half arch window pieces. And those beautiful new fences in Black are a must have!! Make a secure deposit at the highly respected Brick Bank, featuring an array of intricate details and hidden surprises. Easy-to-remove building sections provide access to the detailed interior, comprising a bank with an atrium foyer, tiled floor, arched windows, ornate chandelier, lockable vault and a transaction counter with security glass; a laundromat with printed window, tiled floor and 4 laundry machines; plus 2 second-floor offices with an array of detailed furniture, fixtures and accessories. The exterior of the building features a detailed sidewalk and an elaborate façade with carving and statue décor, decorative roofline, large arched windows, central balcony, clock and an accessible roof terrace featuring a large skylight. Jason Skaare is continuing in his tradition of building beautiful modular buildings faster than I can blog them, which means that you get another two for one deal! His Number 20 building is the 32-stud wide Supermarket and Number 21 is Joe’s Plumbing. Both facades are great, and work well together given the similar trims on the corners. My favourite details on the Supermarket are the striped awning and the blue and white trim just above that. The two things that stand out for me on the Joe’s Plumbing building are the window trims and the shop sign. The Supermarket and Joe’s Plumbing are fitted with lighting, which explains the USBs protruding at the rear of the buildings. Both are fully furnished, so make sure you head over to Flickr to check out the full suite of images of the Supermarket and Joe’s Plumbing. Again, thanks for the inspiration Jason!